The Ferrari 599 GTO has a top speed of 335kph. TURIN – Ferrari S.p.A. on Thursday released the first images of the 599 GTO, the company's fastest road car. The 599 GTO, which is a limited-edition variant of the 599 GTB coupe, makes its public debut at the Beijing auto show that starts April 23. A select group of Ferrari customers will get a look at the car in Modena, Italy, on April 14. 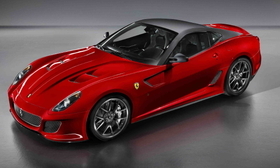 The 599 GTO is derived from the 599XX, a limited-edition racecar variant of the 599 GTB coupe. The 599 GTO's 6.0-liter V-12 engine delivers 670 hp – 50hp more than the standard powerplant in the 599 GTB – and pushes the car to a top speed of 335kph (about 208 mph). The 599 GTO accelerates from 0 to 100kph in 3.35 seconds. The 599 GTB reaches 100kph in 3.7 seconds. Because of it is lighter and more aerodynamic than the 599 GTB, the 599 GTO's CO2 output is even less than its sister model (411 grams per kilometer compared with 415g/km for the 599 GTB). Ferrari will build 599 units of the 599 GTO. The car's starting price has not been announced yet, but in Italy the 599 GTB's base price is 251,000 euros (about $334,380).